Today we're excited to chat with Tod Olson author of Lost In The Antarctic. Read on for more about Tod and his book, an interview, plus an giveaway! Tod Olson is the author of the historical fiction series How to Get Rich and the four books in the Lost series--Lost in the Pacific, 1942; Lost in Outer Space; Lost in the Amazon; and Lost in the Antarctic. He has written for national magazines on the Columbine school shooting, homeless teens, the murder of Matthew Shepard, and many other stories of interest to children and young adults. Tod holds an MFA from Vermont College of Fine Arts and lives in Vermont with his family, his mountain bike, and his electric reclining chair. To learn more, and to download free teaching resources, visit his website: todolson.com. Meet Lost In The Antarctic! Climb aboard the doomed ship Endurance to join famed explorer Ernest Shackleton and his crew who must battle the frigid Antarctic elements to survive being stranded at the edge of the world. There wasn’t a thing Ernest Shackleton could do. He stood on the ice-bound Weddell Sea, watching the giant blocks of frozen saltwater squeeze his ship to death. The ship’s name seemed ironic now: the Endurance. But she had lasted nine months in this condition, stuck on the ice in the frigid Antarctic winter. So had Shackleton and his crew of 28 men, trying to become the first expedition ever to cross the entire continent. Filled with incredible photographs that survived the doomed voyage of the Endurance, Lost in the Antarctic retells one of the greatest adventure and exploration stories of all time. When I was 11, I spent a vacation engrossed in the book Alive. It’s the story of the Uruguayan rugby team whose plane went down in the Andes Mountains, stranding them with no food supply except the bodies of people who had died in the crash. For three days I turned pages breathlessly, wondering are they really going to …? (yes), and what would I do …? (pass the salt). Nothing like a good cannibalism story to turn a kid onto books. That reading experience was the inspiration for the LOST series. I think kids crave books that are as absorbing as Xbox and their buzzing phones. And yet there’s not enough nonfiction out there that tries to fill that need. Steve Sheinkin talks about getting kids’ nonfiction “out of the health food aisle,” and I guess that’s the goal that motivates me. There’s no reason why kids shouldn’t be picking narrative nonfiction off the shelves the way adults consume Unbroken or Devil in the White City. We just need to give them books in which learning happens as an unintended consequence of great storytelling. I love the interplay between Shackleton, the expedition leader, and Thomas Orde-Lees, the fussy engineer whose job it was to oversee their supplies. Shackleton used food to boost morale, breaking out the delicacies whenever the crew looked discouraged. Each time he cracked open a new jar of jam or can of peaches, Orde-Lees complained bitterly to his diary that his boss was squandering their rations. It’s a conflict you can imagine playing out in households and between friends everywhere—the free-spirited optimist and the cautious pessimist. Apparently we don’t leave our true selves behind when stuck on an barren ice floe for the better part of two years. The covers of the LOST books are done by an artist named Shane Rebenschied, who starts with photos and then manipulates them digitally. When I first saw his work I was worried about the choice. He does a lot of fantasy covers, and photo illustration can look kitschy if the tone isn’t right. After As soon I saw the cover for LOST in the Pacific, I was completely convinced. My goal for the series has always been to write thoroughly researched and sourced nonfiction that nonetheless reads like fiction. Shane is great at what he does, and the covers feel like a perfect blend of the two. I look forward to each of Steve Sheinkin’s books, and his next one is about the first women’s cross-country air race, featuring Amelia Earhart and a cast of bad*** pilots. Can’t wait. I just finished the Broken Earth triology by N.K. Jemisin, and it feels like something entirely new. It’s about injustice and marginalization, but the lines drawn in her society are completely different than the lines drawn in ours. And it’s all set in a world that feels completely realized and yet so wildly imaginative it often seems like the product of free association. Try, try, try to trust the process. It’s probably more accurate to say that I relearn this every time I sit down to write. Even in nonfiction, there are a thousand choices you can make at the end of every sentence. I’m naturally wired to stop and consider the pros and cons of each one until an Objective Standard emerges to end debate once and for all. This is not an ideal strategy for finishing a book before your time on Earth expires. I will never be a stream-of-consciousness writer, but I do what I can to silence the judge in me until revision time: write early in the morning, before my brain has fully woken up; give myself arbitrary word counts (which I usually ignore); wait till my deadline is so close I don’t have time to think. That last tactic, sadly, is the most effective. I’ve spent the last ten years as a writer trying to internalize what Alison McGhee told me when I was an MFA student: Follow the whisper. To me this means letting the quiet but insistent voices take control of your writing for a while. Sometimes it means letting the the words on the page be your guide. In nonfiction, you can’t let the whisper lead you away from your sources. But there are plenty of narrative paths you won’t discover unless you let yourself wander. I just finished a stand-alone nonfiction book about the race to climb K2 in the ‘30s and ‘50s. It comes out a year from now, in January 2020. It was a labor of love, and it put me in touch with a fascinating network of climbers, some of whom I’m now lucky to count as friends. As much as I love survival stories, I think I’m done for a while. The story arcs are gripping but there’s a sameness to them, and the voice I’ve fallen into is starting to sound like a tape loop to me. I’m going back to a half-finished novel where I can truly try to follow the whisper. It’s an adventure set in a steampunky alternate 19th century, so it feels both fresh and familiar. After that I hope there’s another nonfiction book in store—a World War II story I’ve been wanting to tell for a while. Even though I’m ready to move on, I want to put in a plug for survival stories. No one knows for certain, but they were probably the seminal narrative genre. The hunting party comes back with a story that’s both enthralling and instructive: This is how you survive a marauding sabre-tooth tiger; this is how you keep from freezing to death while lost in the tundra. I think survival stories endure in part because they are archetypal narratives. They are what we expect a story to be. There’s a catalyzing incident—a plane crash, an earthquake, an explosion on a spaceship. The conflict is stark—a battle for survival against the elemental forces of nature. The stakes are high—you fail, you die—and the resolution is unambiguous. What a great project for a storyteller. Even when the characters aren’t eating their friends. Author Of The Week: Chat with Christine Lynn Herman (The Devouring Gray), Plus Giveaway! Author Chat with Melanie Weiss (Spoken), Plus Giveaway! This is a new series for me. My son loves the I Survived series, and this reminds me of it. I will have to get copies of this for my classroom, too! The cover and the story are both very exciting. This book sounds like a great way to to learn about the Shackleton expedition. 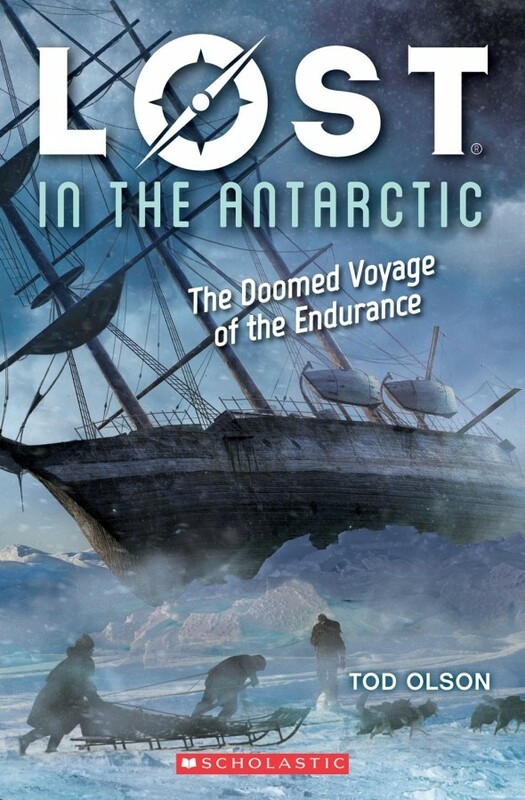 The cover is perfect for this book and I know the Shackleton expedition is so intriguing and must make an exciting survival story. Good luck with your book. The cover matches this exciting synopsis well. I can't wait to read this story! The cover and synopsis both look really good! I like the book cover design. This sounds like a good historical adventure.